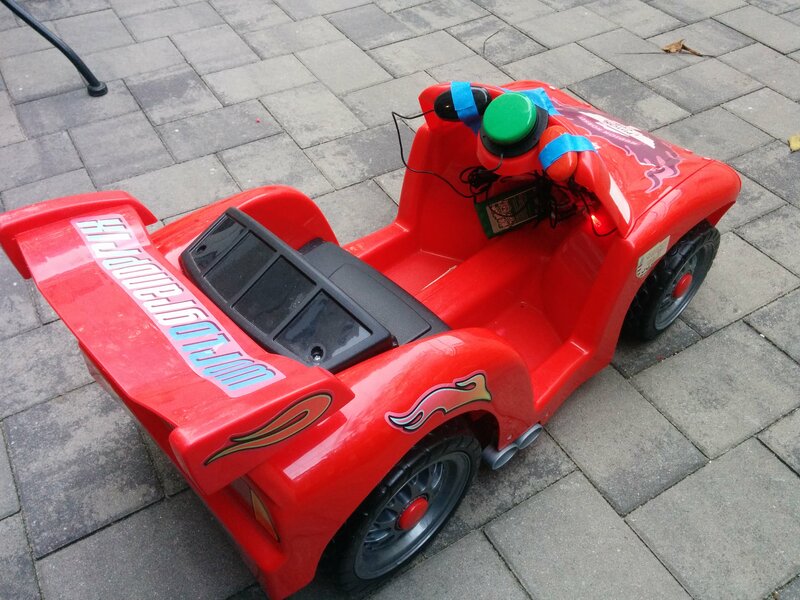 I was acquainted with an almost 2 year old who was using one of these but was unable to turn the steering wheel. 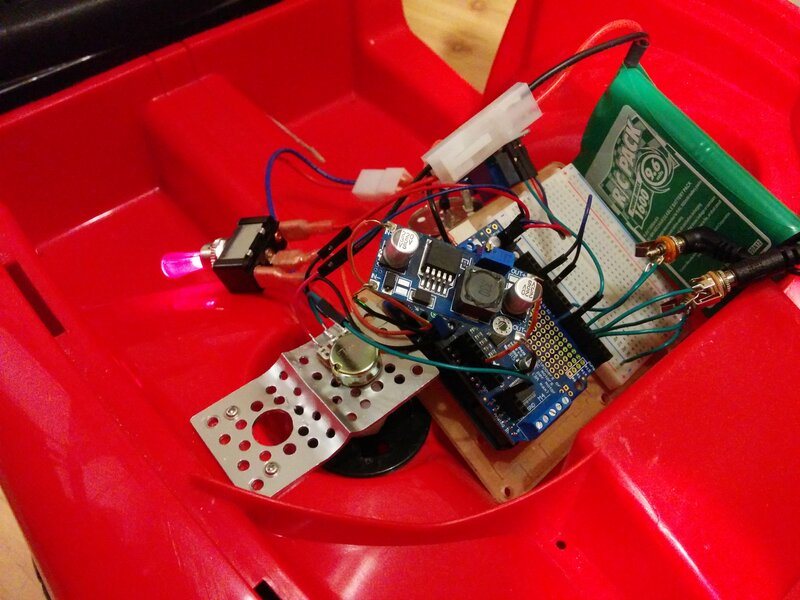 This is my initial prototype of adding buttons for turning left or right in addition to the usual button for forward. I built in switch jacks for all three adaptive switches used for driving. As such any adaptive switches or even an adapted joystick can be easily plugged in. 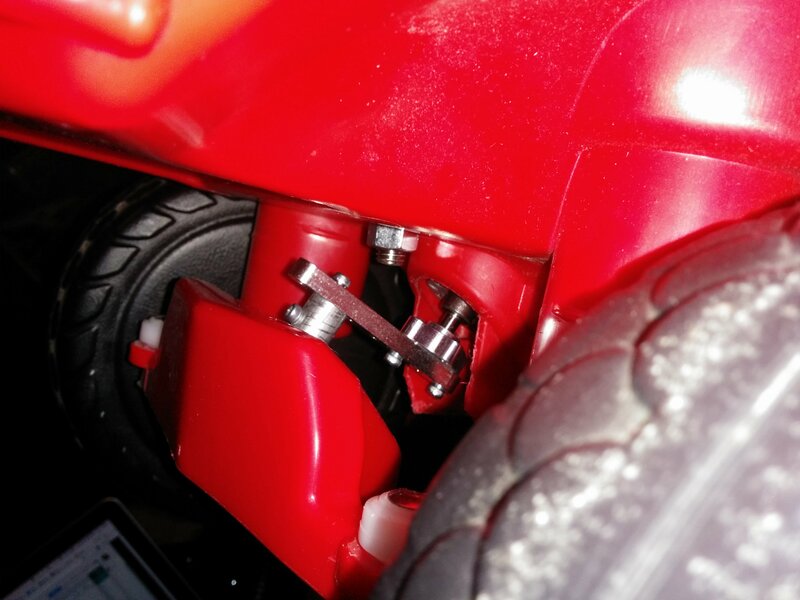 The steering wheel that comes with the car connects to a hollow plastic steering shaft, at the end of which is a finger offset from center that will trace an arc as the steering wheel is turned. 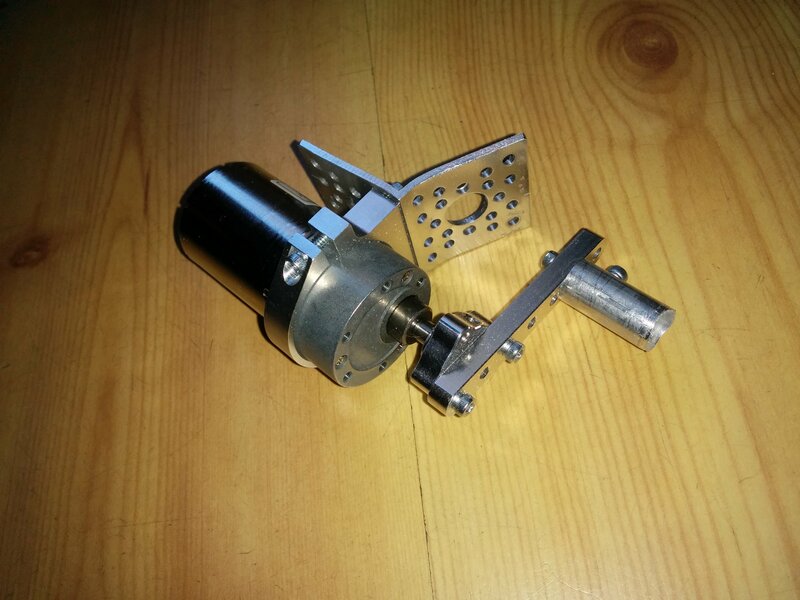 I’ve replaced this with a motor and some metal parts which trace the same arc and engage with the rest of the stock steering mechanism without further modification. 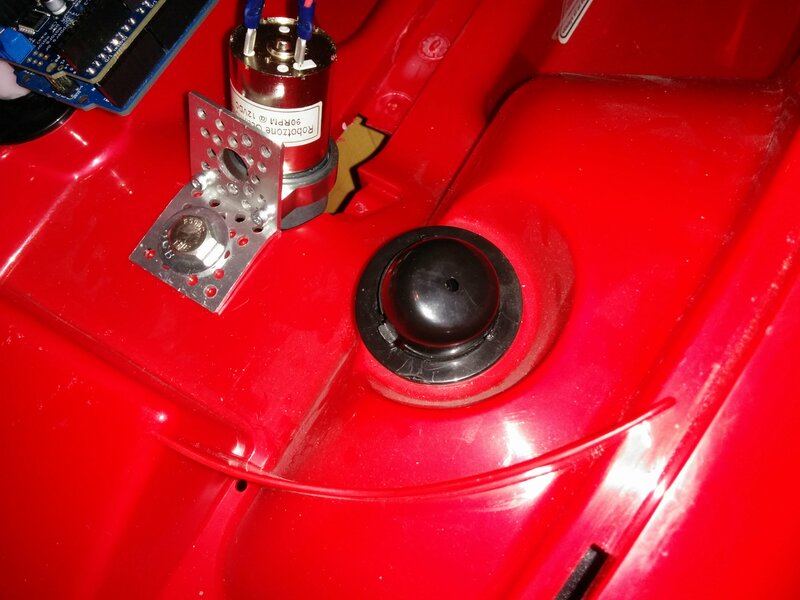 For the steering position, I’m using a simple pot. 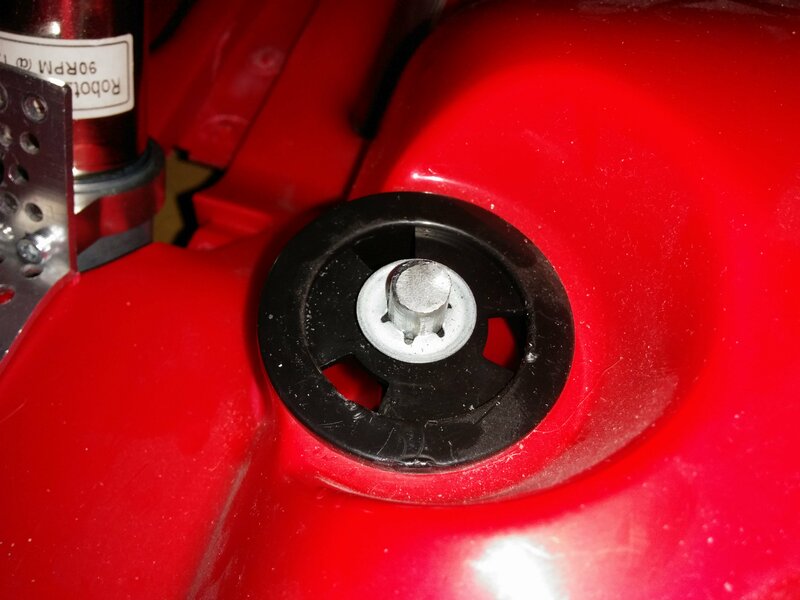 Here’s some pictures of prying off the plastic covers of the metal rods that hold the wheels. When the wheels turn the rods turn. 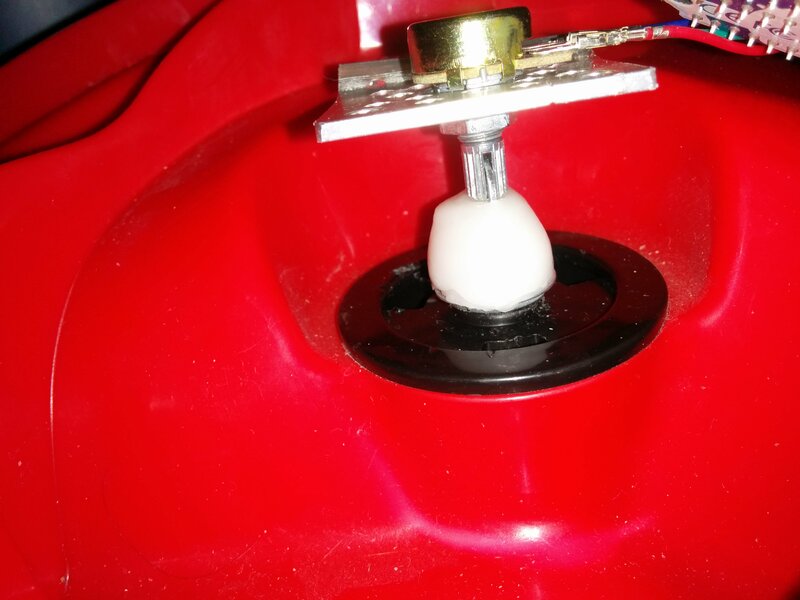 So I used some moldable plastic to attach a washer to the rod. A slot in the knob of the pot engages with the washer in a way that has little rotational slop but still allows for imperfect centering and angle above the rod. 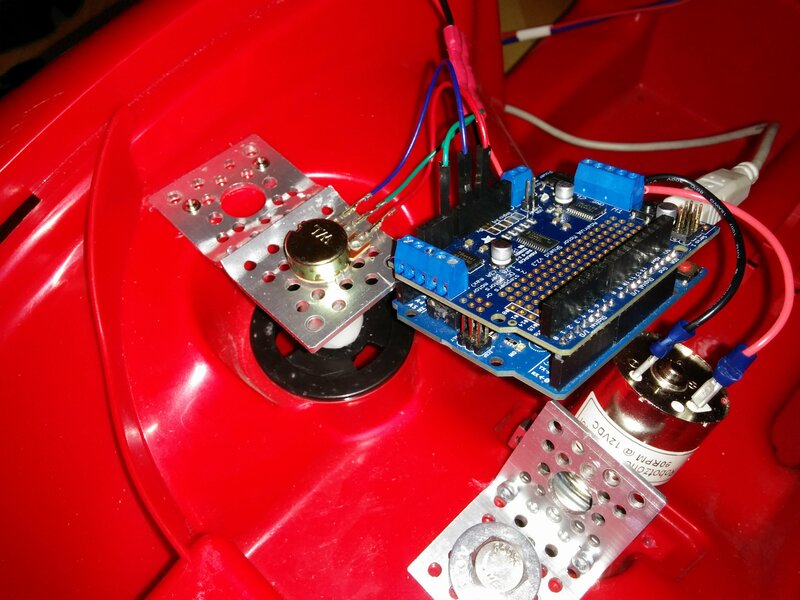 For this prototype, I’m using a separate 9.6V RC battery to power the steering motor, the relay for the drive motor, and the Arduino which implements the control electronics. The 3 adaptive switch jacks are fed to input pins on the Arduino. 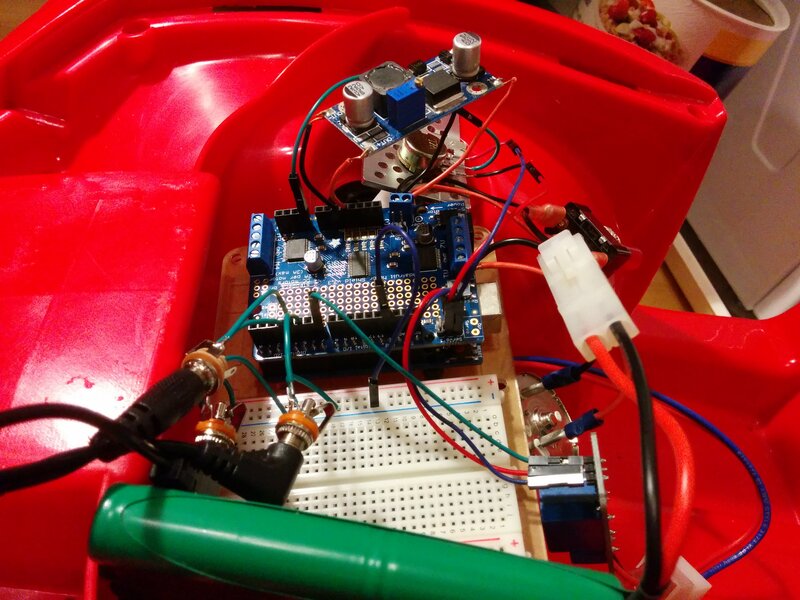 Then the Arduino determines whether or not to close the drive relay (powering the drive motor) and/or what speed and direction to run the steering motor. 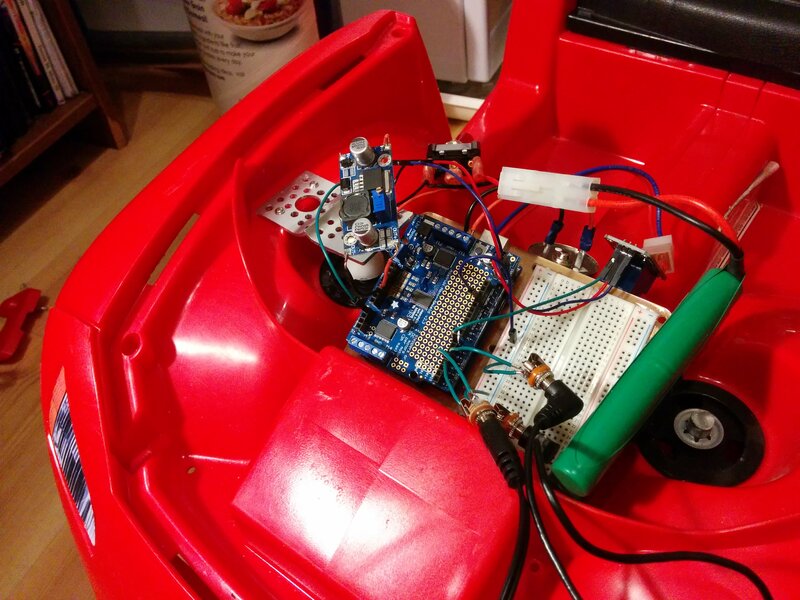 The Arduino, steering motor, and pot form a crude but affordable and quieter servo. The 3 target positions are center (for forward), full left, and full right. 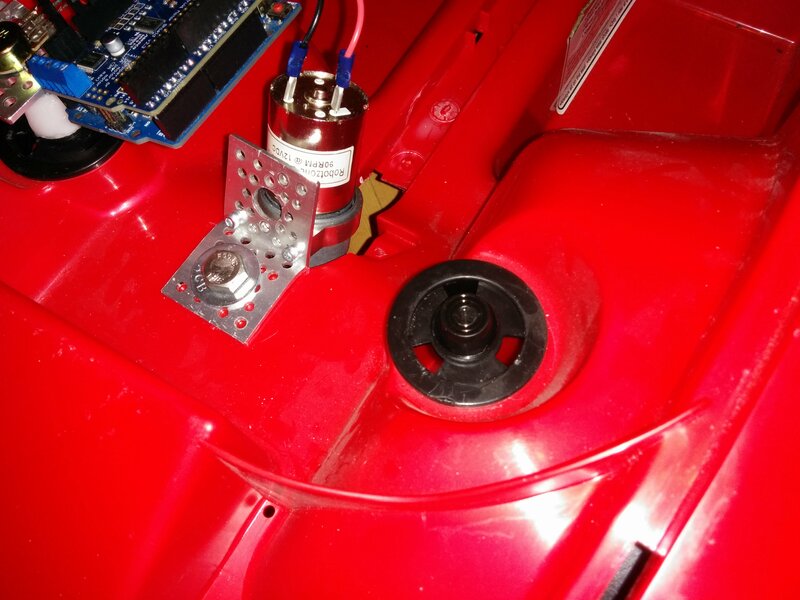 This motor will be eased into these positions while the corresponding button is pressed. 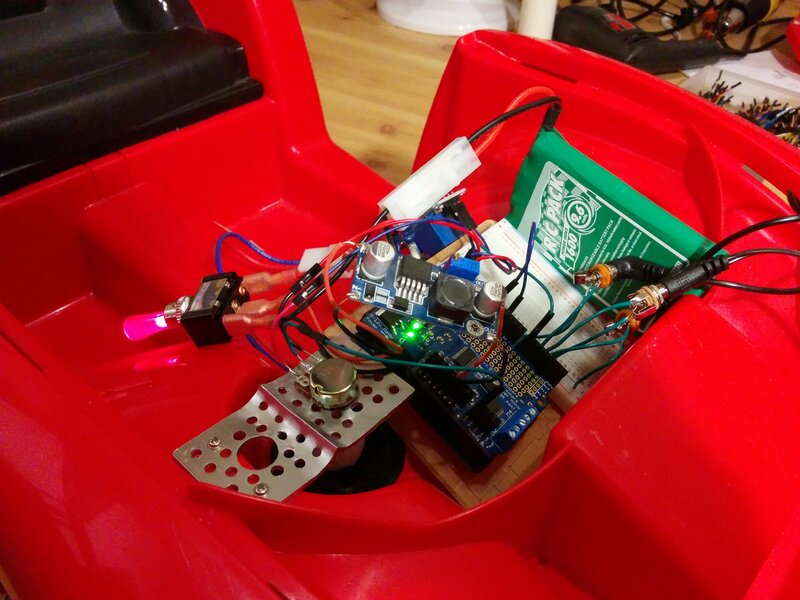 Other things you’ll see in the pictures are the mounting brackets, a lit power switch for the control electronics, and a DC-DC converter to convert the voltage more efficiently for the Arduino and also buffer it a bit for some motor electrical noise immunity. 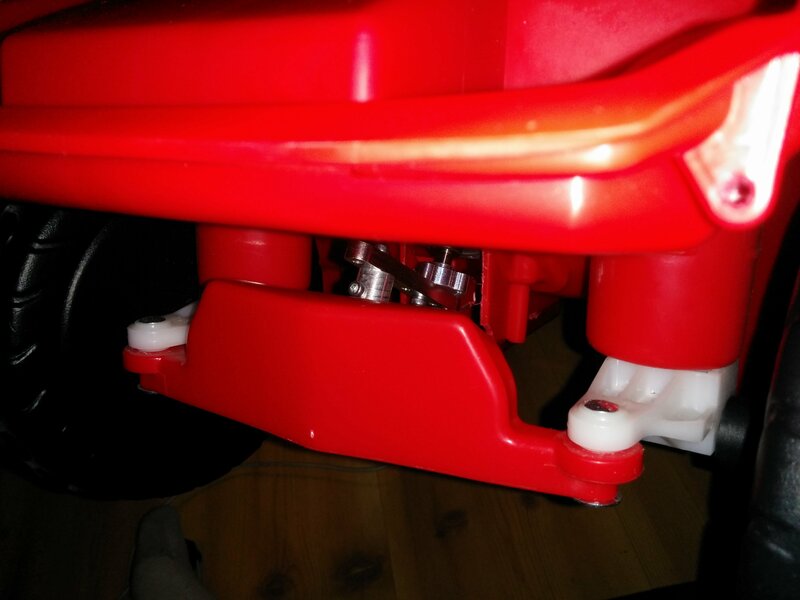 Since working on this, I found out about CooperCars, based off of modifying Hedstrom BOSS ride on toys, a nice starting point since they are already joystick controlled. Unfortunately the BOSS factory burnt down so few are still around. After discussion with the child’s physical therapist and the family, I changed the button controls to a joystick control. At the time of this rework I also thought it a good idea to make things a ‘little’ more permanent since I’d be giving them the car to keep, so I moved most of the electronics to the back under the seat where there was more room. 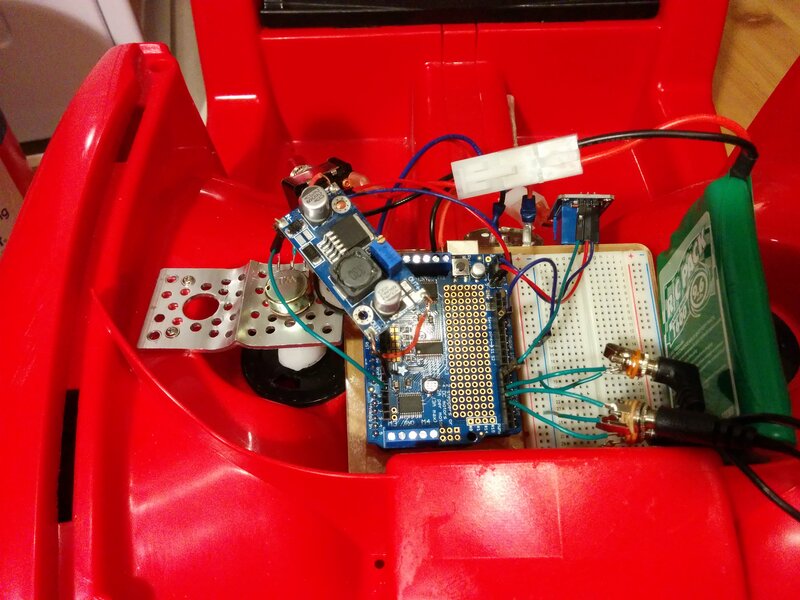 The family then further adapted the joystick to be easier to reach and will continue iterating on it for their son. Here is a video that the mother took of the car in use by her son. 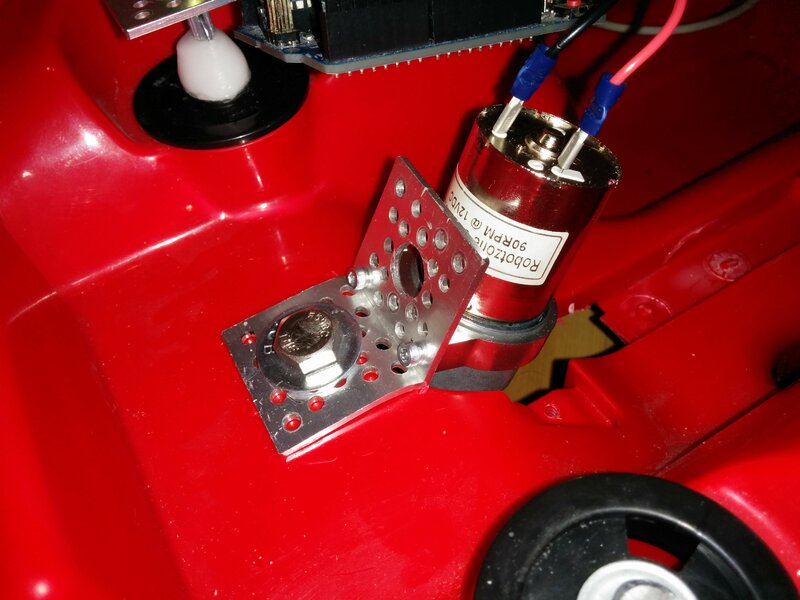 For new projects I would highly recommend starting with a car that already has motorized steering since they are affordable and commonly available now. Then almost all you’re doing is switch adapting the remote control, not too much mechanical (or electrical) work to do. Or as a compromise wire your own control electronics to their steering electronics and leave the remote control out of it. For an example please refer to this car I worked on.